An interesting letter has featured in the Belfast Telegraph, it is from a resident of Larne who wants the Government to come to the realisation that it has been taken for a ride by BT. Many in England, Scotland and Wales have looked at the FTTC roll-outs in Northern Ireland over the last few years with envy but it seems the job is not totally done yet, i.e. there is no absolute 100% coverage of superfast broadband. Back in 2012 the DETI was looking to identify those spots below the 2 Mbps Universal Service Commitment, and with even people from Ofcom suggesting that a fit for purpose USC in 2015 will be a 10 Mbps minimum we are likely to be chasing our tails for sometime. The map above shows the situation as far as the data that Ofcom holds, the area plotted comprises of 534 postcodes and some 5771 premises. Of the postcodes 355 are considered to have a superfast service available. This small map is probably not unlike many other parts of Northern Ireland i.e. 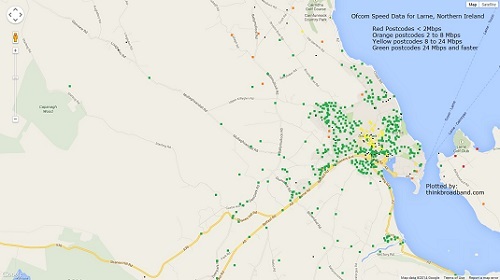 good coverage in town/village but remote clusters of 2 or 3 properties have not seen many improvements. In theory parts of Northern Ireland have a fixed wireless broadband service, but even though technically this should cover wide areas, there are people complaining about its reliability and customer service. The problem to date in the UK (and other countries too) is that targets are set, but enough wiggle room is left that people are unsure as to what they will get and when. The current UK targets of 90% superfast for 2015 and 95% for 2017 still leave plenty of people on older slower connections and an increasing number are voicing anger at having to pay extra to get speeds they feel they were promised in advertising years ago e.g. the up to 20 Mbps and up to 24 Mbps of ADSL2+ advertising. While BT is the easy target and it certainly could do a lot better at making data available on both the commercial and gap-funded roll-outs, that situation has been perpetuated by the weak leadership from those in charge. Though it is not as if the opposition has had much to say on how they would improve broadband infrastructure. At the end of the day, the UK is attempting to improve broadband speeds but with a limited bag of gold coins and almost everyone has a different idea on how it should be spent, and value for money rather than perfection in how the services are delivered are the top priority. What do the black squares represent on the map? Aha - forget them - no data, usually just 1 or 2 premises or just no speed data available. A number of BDUK projects have confirmed that they are NOT doing this and even BT providers FTTC and superfast figures in releases normally now. Read the words, not what you think they say. High Speed Fibre Broadband does not mean superfast broadband. The DETI consultation document was able to say that I was in a less than 2mb postcode area, even though we are connected to a fibre enabled cabinet. 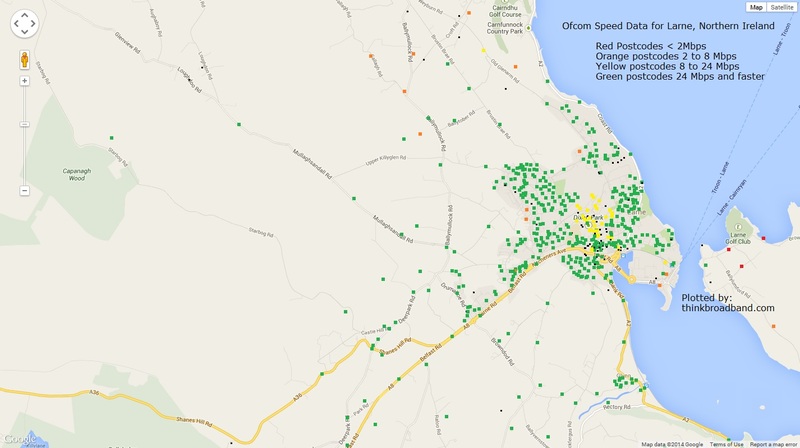 That was at the end of 2012 after the full fibre rollout had finished, but there seems to be very little info or movement since then for all the properties still in the not or slow spots. I stand corrected. I just checked the DETI website and there was a second consultation to narrow postcodes down into basic 2mb and superfast target areas. I'm happy to see i'm in the running for superfast (24mb) and that they have excluded satellite as an option and are dubious it would seem, regarding the fixed wireless suppliers. Only downside is that there's no meat on the bones regarding how and when. As an update and a bit of hope for everyone, BT have signed a 25m contract with the DETI on 4th Feb. They are currently looking at the way the proposed rollout will happen, which hopefully will not take too long as they finished the last updates at the end of 2011, so I'd like to think they have some sort of plan. Starting with my house please!